The wait is over. The Power Pad is now available and this highly anticipated product definitely exceeds expectations! 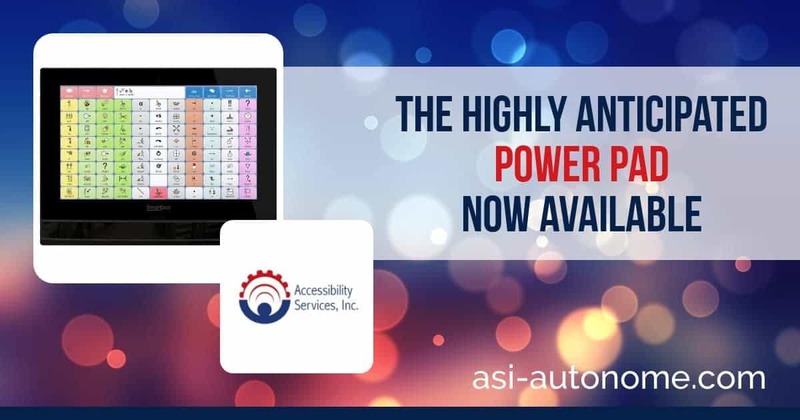 Power Pad is being called the industry’s most powerful, all-in-one augmentative and alternative communication (AAC) solution. Designed for those with complex needs including quadriplegics, the Power Pad is a speech generating device like no other. For one, it is compatible with any AAC access method. This is important for those with progressive diseases such as amyotrophic lateral sclerosis (ALS) as the Power Pad is able to accommodate different input methods as the disease progresses. Everyone is raving about the exceptional computing performance of the Power Pad, which is powered by Grid 3 software, equipped with the Intel® Core™ i5 processor and has expanded memory. These allow the Power Pad to operate faster and seamlessly, even while running multiple applications. Couple this with extended battery life and a second battery which can be changed without powering down and you have one impressive unit. Another attractive feature is the integrated EyeTech TM5 gaze camera featuring an extremely large track box designed to accommodate users with involuntary head movement. High quality Bespoke stereo sound, shatterproof HD Gorilla Glass display and Wi-Fi and Bluetooth round out the Power Pad’s long list of impressive qualities. If you are looking for an all-in-one augmentative and alternative communication (AAC) solution, give us a call. We will be happy evaluate your situation to see if the Power Pad is the right AAC solution for you. Introducing the New Grid Pad Look Out for the Quad Squad!